We had another great year at Cub Resident Camp! For those of you not familiar with our program, we have been doing a Cub Resident Camp directly after the Boy Scout Resident Camp finishes for the summer since 1993. Our theme this year was “Knights of the Campfire” which is a medieval theme. We rotate themes each year, also doing Treasure Island which is a pirate theme and Adventure Island which is a Native American theme. Next year we will be doing Adventure Island. Mornings are devoted to classes where the Cubs work on their Achievements. Afternoons are spent as free time with Waterfront, BB’s Archery, and Handicraft available. Evenings are spent with games, Nature Hike, and tours of the Camp Museum. There are two Campfires and a Movie night for night time entertainment. 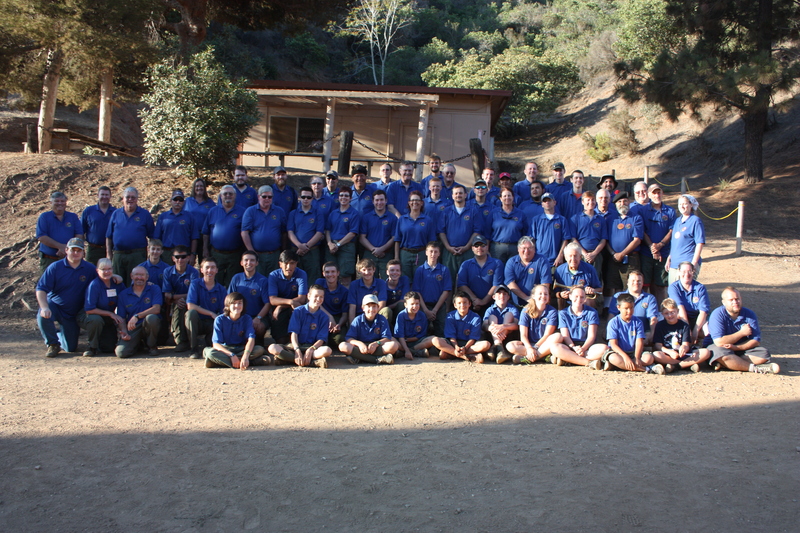 Staff is comprised of members of the CCV Alumni Association, OA members, and previous campers and leaders. Wow!! What a year. This last year has brought a lot of things to Camp Cherry Valley. With the wind and storms the island lost a couple of piers, one being Camp Fox. Here at CCV we had both the Cherry CIMI’s and the Fox CIMI’s as well as their campers. This has been one busy year. In June Fox’s pier was back up and running so we should be back to normal this fall. We are in a stage 2 water restriction. That means that we have to use 25% less water. It is looking like we be going to be in stage 3 come September meaning we will need to use 50% less water. We are using only paper plates in the kitchen and have cut back on all extra water usage. Last year the well at Howland’s where we get our water from started taking on salt. Edison has been trucking us water and bringing us bottled water so we could have fresh water. Last month the new well went on line. It is being filtered and treated so we have pretty good water right now. We are hoping for a lot rain this winter. The way the fishing has been going around the island we might get a little. We had a great summer here at CCV. We had over 1700 camper which brought us to about 71% capacity. This is Cory’s 3rd year as camp director. He and his staff were great. It is really cool to watch young men and women learn new things and see the scouts have so much fun this summer. The real big news is that San Gabriel Valley merged with Los Angeles Council becoming the Greater Los Angeles Area Council. This will make us one of the largest councils. I do not feel like this changes anything for CCV. We are still here to help give youth an outdoor experience. I would also like to remind you that September 11th to the 13th will be the annual Alumni Weekend. It is 85 dollar and you buy your own boat ticket. We are looking forward to seeing everybody. Below is the link to the event. I hope everyone had some time as 2014 wound down to relax and recall the great memories of your year. 2014 was very special for my wife and I spending lots of time with our new daughter, and of course, getting her hooked on Catalina early! We had the opportunity to bring her to the island for several different events including our terrific Alumni Weekend in September. Let’s talk about the weekend for those who missed it, and those who have those short term memory deals. WHAT A WEEKEND! The thrill of getting the group went very well with the combined celebration and bittersweet event of the Hartley’s retirement from CCV. 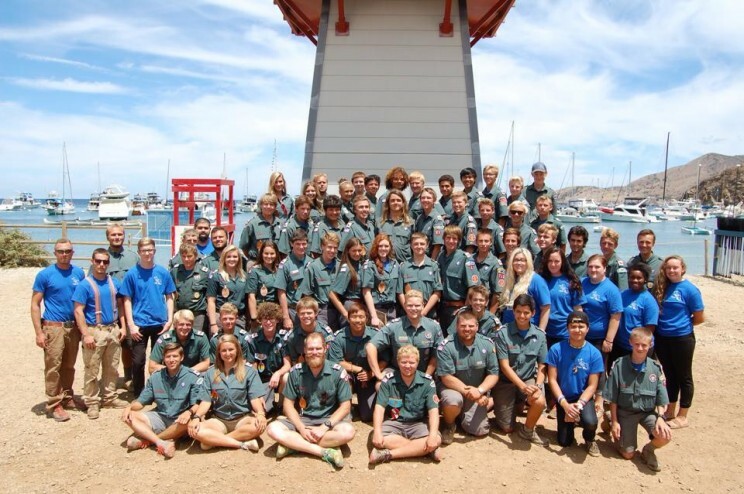 In recent years we have discussed and decided that our Alumni is not just those of our Summer Resident Camp, but also CIMI, Cub Scouts and our terrific weekend programs. This was so evident for our event this past year. By evening as we prepared to lightly roast Bill and Karen the numbers in the dining hall swelled to bursting. Friends once forgotten re-united and shared their love and stories of Camp and the Hartley’s. With gourmet cuisine we were able to highlight some of the great service from Bill and Karen. Not only years of caring for camp, but the Staff’s, island friends, Cherry Cove Yacht Club, the West End Search and Rescue Team and you. To have such dedication for so many years has helped Cherry stay on track, ever improve and continue to grow. Don’t worry, we won’t lose them – after all they are still ALUMNI! So fortunately for all of us and Camp is that Mark Serratt has now been with Bill for so long and cares just as much for Camp. Mark is taking the reins and with Butch Nielson at his side will keep Camp moving into its next great adventures. I know both Mark and Butch love it when we get involved, so please reach out and participate when you can, not only on our weekends. Just call the camp office and see what you might be able to help with. 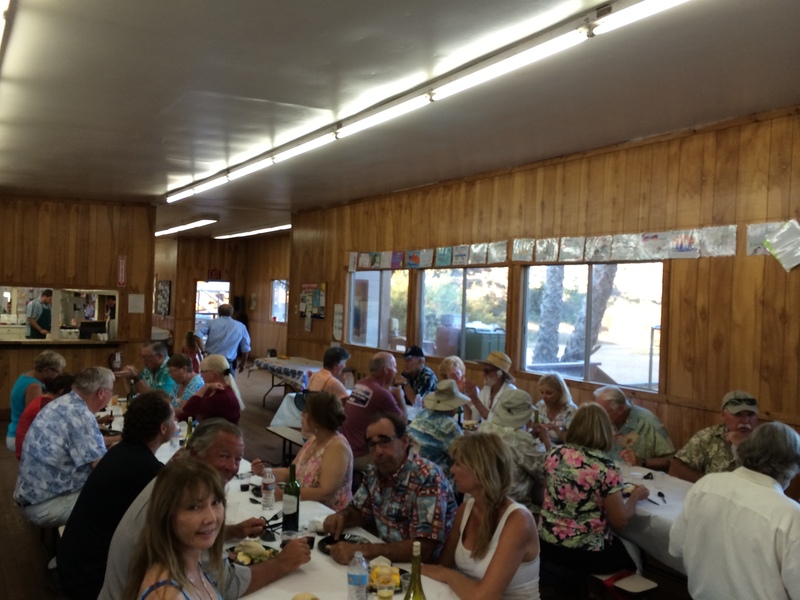 We are planning the Old Goats Weekend this year for September 11-13, 2015. Please mark your calendars and plan on coming out. We are reviving old stories and coming up with new ways we can help camp through our Association. Please save the dates and stay tuned for more updates on some planning meetings and our Alumni weekend! As my retirement date quickly approaches and I try to write this last article, my emotions are all over the place. I’m excited to be moving back to my family but on the other hand sad to be leaving Cherry and the close bond that I have developed with many of you. So many good people have come here to be a CCV Staff member and to do the important work that we do, I feel so proud to have been apart of it. It is so important to teach our youth about Scouting, the environment, and the value of the out of doors that we as CCV alumni must continue to do what we can do to continue to support and nurture this wonderful place. Many of you already know Karen and I arrived at Cherry to start our jobs on February 1,1989. Both Ron and Judy Wood would arrive soon to help us get moved in, but that first night was a real eye opener. The quite was something I had never heard before and the abundance of wild life was impressive. As I walked around the camp that first morning I felt alone for the first time in my life. It quickly became apparent that I was anything but alone. I learned that Karen and I were sharing the valley with a bison, numerous pigs, deer, fox, quail, squirrels, and ravens, not to mention the abundant sea life we saw on our first snorkel. Those people that have the opportunity to experience Cherry Valley when all the campers are gone are treated to a truly wondrous place. For the remainder of that winter and spring I had the opportunity to hike all over the valley and the west end to discover that not just Cherry was special but all of Catalina as well. As a camper for three weeks (mid 60’s) and a staff member for three summers (late 60’s) and now a year round resident I was excited to see the campers arrive and begin to enjoy this wonderful place. Watching the staff do their stuff and seeing the campers enjoy the program and this place was a true joy to be apart of. 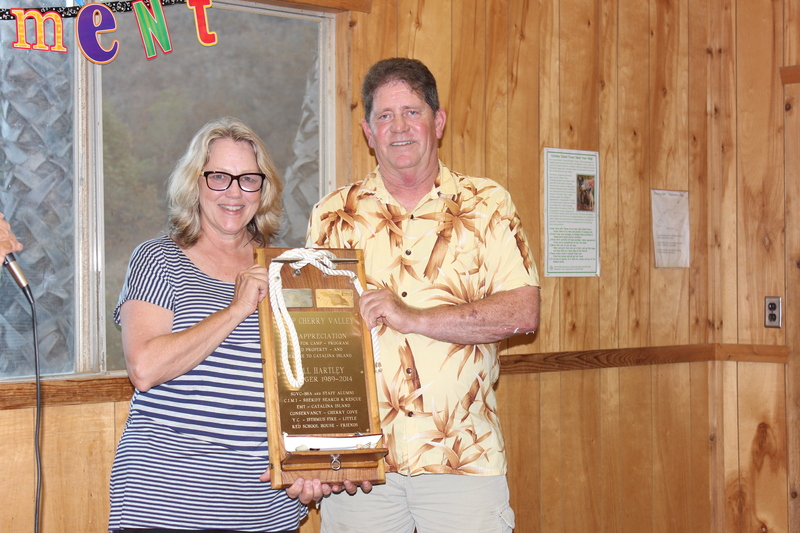 Whether the campers were here to participate in a BSA Program or environmental studies the staffs, the program and the place never failed them. The kids were better for having come here. The friends Karen, Kevin, and I have made here are some of the best people in the world. 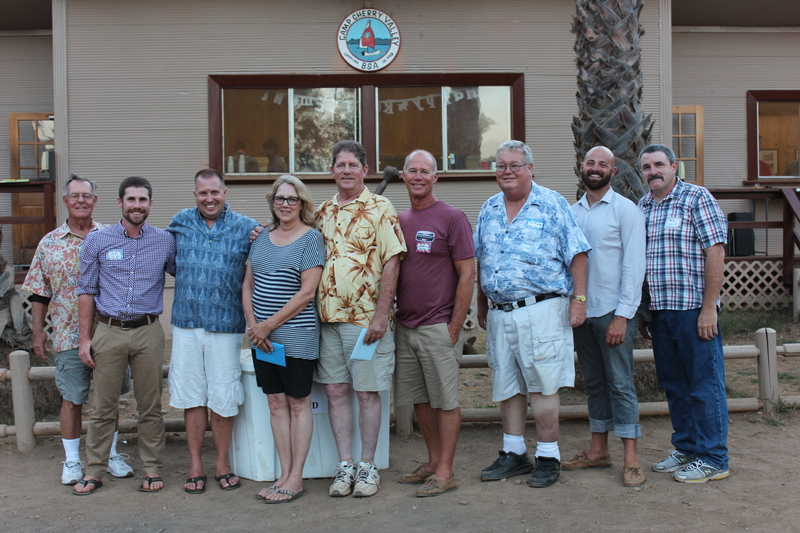 Not only those that were on staff but the town of Two Harbors, other camps, the county agencies, and the Cherry Cove Yacht Club are so kind, thoughtful, friendly, and honest. There is not a member on the Search and Rescue team that I would not trust my life with. Mark, thank you for the time we spent together my friend. 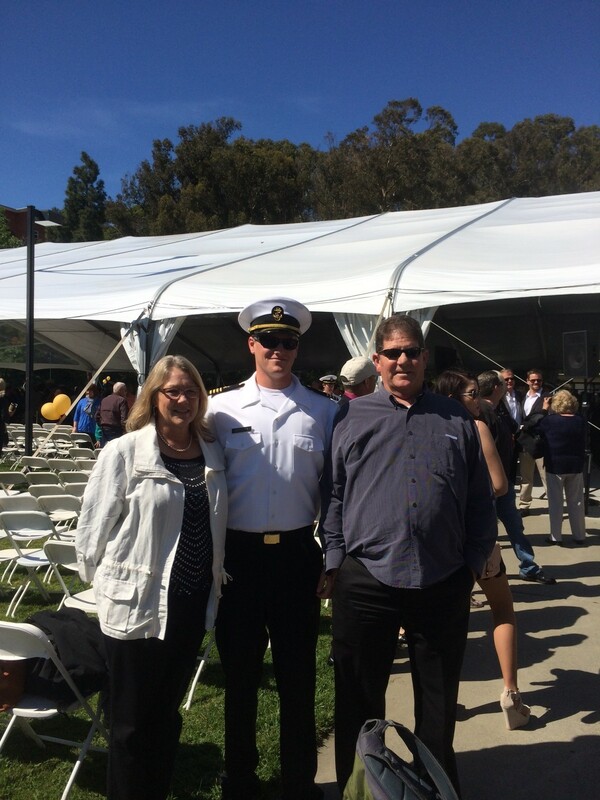 My family thanks you all for everything you have done for us. We have confirmed that weekend for June 14-16. 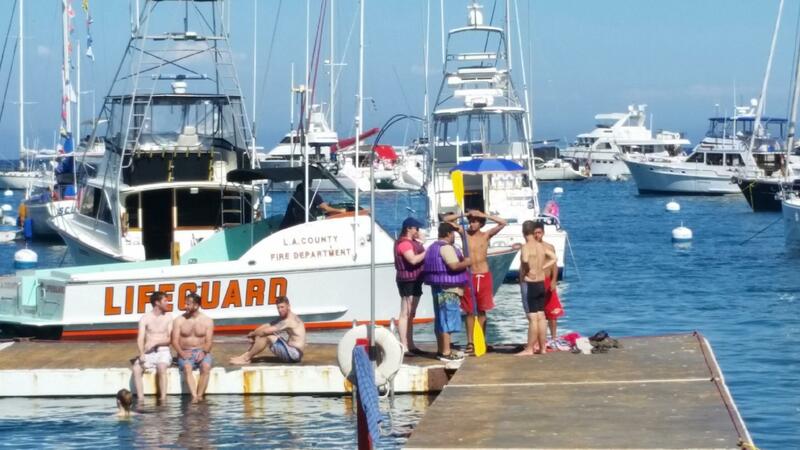 If you are looking for an opportunity to come visit camp/Catalina, share tall tales, help and play if you want – then try to block your time. The key of coordination will be knowing who’s coming to help ensure there is food. Karen Hartley has volunteered to help coordinate food with the Summer kitchen staff. A set price of approximately $100 will cover food per person including use of all camp activities. Boat fees are also on our own which are currenttly $72 round trip. Arrival and departure times should also be somewhat similar and hopefully people can book on the same Express. That will minimize the getting in and out if camp….but we will work on suggestions for that. Please let me know. Hope to see you in June! We finished up our summer 2002 season and things have been going very well. Dave Minnihan ran his first Cub Resident Camp program this year and it looks like the kids had a great time. Dave Hopkins, the Summer Resident Camp, Camp Director, had a very good summer and is looking forward to returning next summer. Tina Renzullo had a great spring program, her official first season as Program Director and she did a wonderful job. Buddy Renzullo will direct this falls weekend program which begins this coming Labor Day Weekend and will run program on the weekends until the end of October. 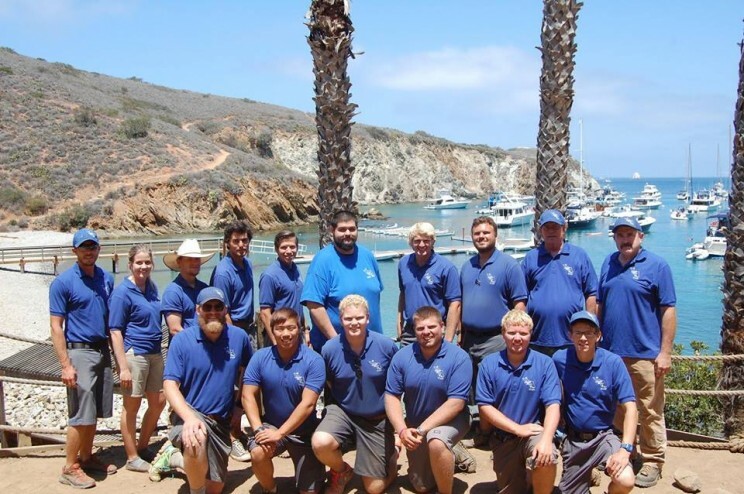 Andy Balindy is also beginning is second season at Cherry as the Program Director for Catalina Island Marine Institute, Cherry Cove program. I should also mention Karen Hartley’s efforts as the Food Service Director for both the SGVC spring and fall weekends and Summer Resident Camp. In my bias opinion and that of the Program Directors she works with she has done an incredible job. She and her staffs have provided excellent food, kept the kitchen and Dining Hall as clean as possible, and smile at campers, while producing up to as many as 5,000 meals a week. Mark (Bear) Serratt, our Camp Ranger for over six years, has been busy around camp. 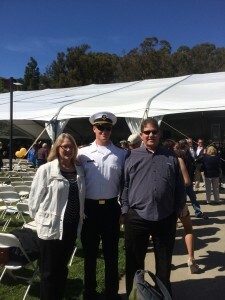 Following a very productive winter and spring building and development phase he shifted his focus to program support, repairs, and facility service. He is currently shifting back to improvement and development for the up coming fall. He is one very talented man. He is also a very good friend to every program staff member that works here. Speaking of what we are planning on doing this fall. We are very close to receiving L.A. County’s approval for our water storage tank and will begin on it as soon as we do. We also have been working on the permit to replace one of the Commissioner Cabins and hope to start on that very soon. We our in the planning phase to start make some improvements on the waterfront. Decking, walkways, program equipment storage, boat racks, and more are being work on. We also will need to spend some time on the regular camp maintenance needs like painting, landscaping, equipment maintenance, and on and on and on. Following the water tank project completion we can really begin to make the bigger improvements. Beginning with getting the “New” Camp Store on line then relocating the Warehouse and housing improvements. I would like to make a point at this point in the story. The costs of these improvements are way off the charts. Fire suppression alone will cost us close to one million dollars to complete. The anticipated cost to replace the Dining Hall was $350,000 in 1993. Today the proposed Dining Hall is around two and a half million and I’m confident that when it is competed we will have spend over three million, assuming we are able to start within the next couple of years. My point is that by the time you have a plan, raise the money, get the permits, and begin the construction, the project will already cost more than you planned. On August 1, 2002 we had the dedication ceremony for the new lighthouse. Thomson’s Light has become a great asset to the camp and everyone is most grateful for it. The Alumni visited CCV twice this year and each time the staff waddled out of the Dining Hall. Thanks everyone. 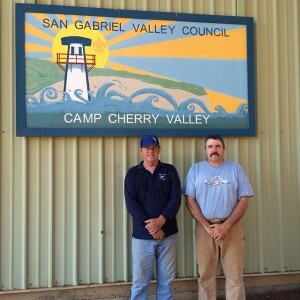 The San Gabriel Valley Council – BSA is improving Camp Cherry Valley. The process began in 1993 when we wanted to replace the camps existing Trading Post with a new Camp Store and Craft Center. Following the on site arrival of the two building sections the Fire Department notified us that we needed to upgrade our fire suppression systems to meet current County Fire codes before we could finish and occupy the new store. It was also recommended that we develop an over all master plan for the property. By December 1998 we had completed all of the necessary studies, reports, and planning required and received approval from LA County Regional Planning and the Coastal Commission for the CCV Land Use Plan. I should also mention that this process not only took five years but cost several hundred thousand dollars to accomplish. The fire suppression requirements for an isolated youth camp in fire zone 4 are as extensive as any property. We are required to store enough water on site to keep the system operating for 2 hours at specified pressures and volume. The code also calls for the system to be replenished within 12 hours, which the island water system cannot do, so we had to more than double the size of the tank. We are required to have every building internally suppressed with sprinklers, each building must have external hose boxes for exterior fire suppression, and fire hydrants throughout camp for fire truck connections. All of the fire system components must be connected to the storage tank with a dedicated piping system. To meet the camps current and future development plans and comply with these fire codes we needed to replace all of our existing domestic plumbing supply lines as well. So beginning in early March of 2002 we started digging a 3’x3′ trench from the beach all the way to the top of the camp road. In the trench were placed a 3″ domestic fill pipe, a 6″ fire supply pipe, a 3″ domestic supply line, several electrical pipes with boxes, and many other components such as valves, connectors, tracer wires, and more. All of this was done while running program and maintaining our existing utilities. What does it take to do a job like this? Eight men, two back hoes, a crane, two utility trucks, two dump trucks, and hundreds of tools. Getting the men, equipment, tools, and materials to the camp starts the adventure. A tug and barge arrives at the cove early one morning, lowers its 40′ ramp, and within two hours all of the equipment is on the beach. Everyone one takes a deep breath and the backhoe starts digging. 20′ feet down the road we broke our first water pipe. Digging through CCV has been unique; we are finding old bottles, abandon septic systems, pipes, and other items but mainly we are finding out where all our old active pipes are located. We’ve got water, sewer, gas, electrical and communication pipes all over camp and only a small portion of which ever made it to an as built drawing for future reference and locating. A lot of hand digging and careful backhoe work was done in the lower portion of camp. A part of this project that can be very interesting is the county inspection and approval process. Through out the planning and construction phases various agencies must inspect the drawings, work and materials. To follow the fire code to the letter we are supposed to install, fill, and pressurize all the pipes while they are exposed to insure that there are no leaks. Leaving almost 4000′ of trench open down the center of the valley for several weeks is tough, impossible while operating program. The Fire Department has allowed us to cover up the days work and when we have completed the instillation we will pressure check the underground pipes and if there is no pressure loss we are good to go, if not, we dig up the pipes for a visual inspection. Not a good thing. As I write this we are entering the finial week of this phase of construction. We are running the future attaching lines to the existing buildings and proposed building sites, installing the fire hydrants, and hose boxes. When everything is installed we will flush the pipes, cap all the ends of the pipes at the buildings, and refill the pipes with water, put the entire system under pressure and hope it holds. If all goes well we should have our finial inspection from the fire department this week. We still need to install the water storage tank and will do so as soon as possible. We hope to begin the grading and foundation work for the tank very soon. When completed and finial approval is obtained we can move forward on our building projects. The first building to go on line will be the new camp store, we hope to make some improvements to the Resident Cabin, install some program housing, and relocate the Warehouse. By then we will be ready to start the new Dining Hall. Many other improvement projects are planned such as Sea Breeze, campsites, most program areas will be improved, another restroom facility built up canyon, and replacement of the Commissioners Cabins are also planned. Along with the underground plumbing project we are also installing the new Lighthouse. This began with a big hole (2’x12’x12′) being dug in the middle of the beach. Then a form is built and PVC coated steel is tied with vinyl coated wire in to a cage, which fits inside the form. Anyone concerned about rust? The cement mixing process was different. The cement comes in ½ yard bags, the bags are lifted by the crane and held over the cement truck shoot where they are emptied and water added. When the mix is ready it is poured into the form and vibrated to insure a solid pour and slab. We are now the owners of the best concrete slab on the island, with 5000-PSI cement. The cement slab is 2’x11’x11′ and will support and anchor the 28′ Lighthouse. When we began the whole project the Lighthouse missed the barge and arrived by tug when it was ready. It was another CCV adventure with the Kingfisher II lifting the pieces off the tug bring them to shore and having the crane lift them off of the beach for storage above the tide line. The next day the first two sections were installed and the catwalk was attached. After the third section was installed we ran the “over 500 lbs. test”. The next morning we finished the job by installing the roof, inside ladders, and sealing the seams. In 1998 our old Lighthouse was brought down by 70+ MPH winds. Even thought the Lighthouse was used as a lighthouse for several years when it was first built for most of its life it was a lookout tower and storage facility for the waterfront. It retained the name Lighthouse because of its appearance and relationship with the Land Ship and the camps nautical theme on the beach. The new structure will better facilitate both of its primary functions by giving the program staff a better visual advantage of the cove and improve our storage capacity.